Designed for rigorous use, the Star Trac 3900 treadmill is a commercial-level machine that has been installed in health clubs and fitness facilities all over the world. 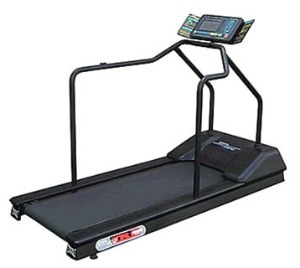 They are pricey when sold as new, but for just $1899 you can get this as a remanufactured treadmill that will look and run just as good as new. The Star Trac 3900 treadmill has an LED console with an 8-character message window showing dedicated time, distance, incline, speed, heart rate, MET, calories, and course profile, as well as a ¼-mile motivational track graphic. The 13 pre-set workouts include Dynamic Heart Rate Control and Constant Heart Rate Control. UPDATE: The Star Trac 3900 treadmill is no longer available. Check out the most popular models on sale here. The treadmill reviews on the 3900 are universally favorable since Star Trac makes some of the best and most popular commercial machines in the world. There are two identical models with different numbers – the Star Trac 3900 treadmill sold in North America and the Star Trac 3500 which is sold overseas. These models feature a commercial size 20" x 62" running area, and a 2.5 hp continuous duty direct current (DC) motor that is quiet and cool running with low RPMs. It has the same patented soft deck as the one used in Star Trac’s top-of-the-line 4500 Series. This Impact Absorption System (IAS) includes a dual-cavity neoprene rubber cushion that runs along the entire deck to absorb impact and alleviate excess stress on the knees and joints. This unique system provides a 50% softer running surface for improved comfort and stability. The Star Trac 3900 treadmill also features an incline range up to 15% in 0.5% increments, and a speed range from 0.5 mph to 10 mph (0.8 to 16 km/h) in 0.1 mph increments. More features include a built-in reading rack, water bottle holder, and a place for a workout towel and a personal MP3 player. High-end treadmills used in health clubs are designed to run 7 days a week, 8 or more hours a day, with users up to 350 pounds on the machines. They can cost between $6K and $10K depending on the features. When a treadmill is remanufactured by a certified technician, it is stripped, rebuilt, recalibrated, and new components and electronics are installed. It will perform as well as the first day it was delivered to the health club. By buying a reconditioned unit, you are saving 60% or more off the original cost but getting a rebuilt drive motor, new belt and deck, and much more. If you are considering saving a ton of money and going with a rebuilt Star Trac 3900 treadmill, you have made a good choice. 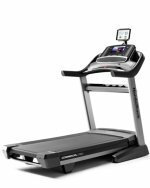 It retails for $5,295 new with a 3-year warranty (Note: most high end treadmills have a 10-year parts warranty), or $1,795 as a remanufactured treadmill with a 90-day warranty.